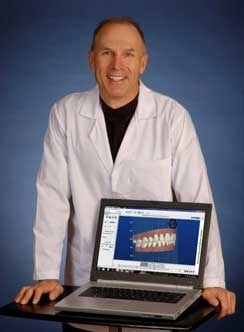 Aloha and welcome to the Orthodontic/Dentofacial Orthopedic practice of Dr. Keith Vodzak. Whether you choose clear braces, clear Invisaligners or even metal braces - we are Hawaii's "Clear Choice" alternative. We take great pride in helping you or your child obtain that new smile using the most advanced aesthetic methods available. These computer generated techniques and space-age materials can now be done faster than ever before. By using methods recently approved by the FDA, treatment can now be accelerated by as much as 50% ! Our techniques now look better and work faster. Dr. Vodzak will spend whatever time needed to fully explain ALL of your options. This includes demonstrating the different facial changes that can be obtained with each treatment alternative. Then YOU get to choose. We use mainland techniques with a local ohana atmosphere. Dentofacial Orthopedics allows us to modify a child's bones and muscles while they are soft and growing. By using these techniques we can routinely avoid extracting teeth and obtain a better looking facial appearance. Ultimately, we really want to improve confidence and self esteem. By doing so we help our patients to be happier, healthier and more successful. If you have been told that your teeth cannot be treated using clear appliances, or if your child is too young for orthodontics, - have us take a look. Dr. Vodzak has successfully treated thousands of patients and is known for taking on difficult cases. Experience matters. Invisalign or ClearCorrect is a new system using clear trays to straighten teeth without the use of conventional braces. Ceramic braces utilize less noticeable brackets for patients concerned about aesthetic appearances. Simple cosmetic enhancements or major facial changes are possible in conjunction with orthodontics. Through advanced techniques your teeth can now be straightened as much as 50% faster! Dr. Keith Vodzak received his D.M.D. degree, (Doctor of Dental Medicine - equivalent to a D.D.S. ), from the University of Pittsburgh School of Dentistry in 1980. His M.S.D. degree, (Master of Dental Sciences), was awarded along with an Orthodontic Certificate from the University of the Pacific, San Francisco in 1982. Dr. Keith Vodzak, Orthodontist / Invisalign & ClearCorrect Provider of Hawaii - (Hawaii Kai / Honolulu / Kailua / Kahala). Hawaii's Clear Choice Orthodontist. Straight teeth with quality orthodontics using Clear Aligners, Invisalign, Invisalign Teen, Invisalign Express, Clear Braces, Tooth Colored Braces & Vivera Clear Retainers. Dr. Vodzak is a specialist in Orthodontics & Dentofacial Orthopedics using clear aesthetic solutions for both children & adults of all ages. Straight teeth, healthy bite, beautiful smile - improve your image, confidence and self esteem. All done with Aloha.